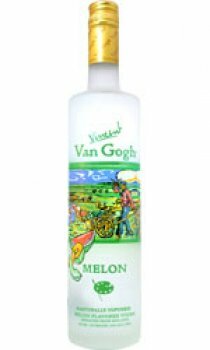 Introduced in mid-2003, the artfully crafted Van Gogh Melon Vodka is a delightfully soft flavour featuring a smooth blend of honeydew and Spanish cantaloupe with undertones of honey and cucumber. Van Gogh Melon Vodka is hand-crafted in small batches through a unique double infusion method, using only natural ingredients and premium grain alcohol, insuring that Van Gogh Melon Vodka actually tastes and smells exactly as the name suggests: like wonderful blend of ripe melons. Notes From Tim Vos, Master Distiller "Our melon flavour is a mixture of Spanish cantaloupe and honeydew melons. The taste is genuine melon with a bit of honey and a touch of cucumber for freshness. This melange of flavours melds beautifully in the mouth; the taste is soft, smooth and long lasting."